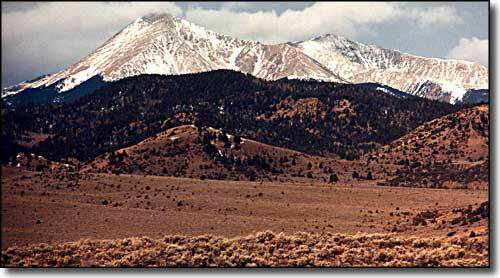 La Veta Pass bridges the Sangre de Cristo Mountains between the Eastern Plains and the San Luis Valley. 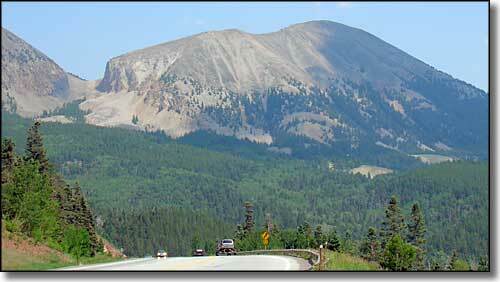 This is the modern route, more properly known as North La Veta Pass, elevation 9,413 ft. US Highway 160 travels through the pass connecting Walsenburg and eastern Colorado with Alamosa, Monte Vista, South Fork, Pagosa Springs, and Durango. Traveling west from Walsenburg the highway crosses the broken plateau of western Huerfano County, passing on the south side of Mt. Mestas and rising along its' flank to the top of the pass. A long section of the route on both sides of the pass is three lanes wide, two lanes for going up - one lane for going down (and the orientation swaps at the summit). It's a long climb up the hill but the scenery is excellent. Before you know it the top arrives and the western vistas open up. It doesn't take too long though and you are down below the surrounding hills and the views close in again. While you are near the top of the pass, just down the west side in the big open meadow area, there's a road heading off to the north with some signs for Paradise Acres. That's Pass Creek Road and it leads up over Pass Creek Pass and then down into northwestern Huerfano County through some more exquisite countryside. It's a beautiful drive that eventually leads back to pavement near Malachite, just west of Gardner. 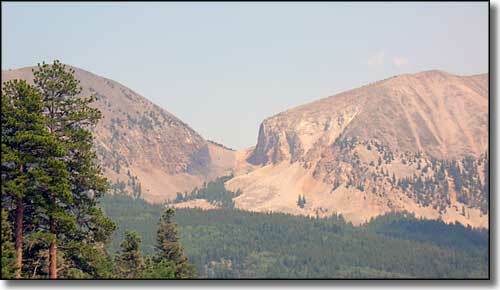 If you are heading for Westcliffe, the Upper Huerfano Valley or the north side of Mt. Blanca, it's a nice shortcut. The view west at the top of the pass. That's the tip of Mt. Lindsey visible in the upper center.